BMW has announced details of the next generation of its venerable M5 super-saloon. In a departure from M5s of yore, the new car uses turbochargers bolted to a 4.4-litre V8 petrol engine. The reason for this is simple; using turbo tech means the gargantuan engine uses 30% less fuel, is 10% more powerful and has 30% more pulling power than the out-going model. The new M5 boasts 560bhp - up from 499bhp - and 680Nm, which means 62mph flashes by in 4.4 seconds. Top speed on the standard car is 155mph, but if you specify the ‘M Drivers pack' then you can go on to a ludicrous 190mph. As you'd expect for such a high performance machine, tax isn't cheap. Carbon dioxide emissions are rated at 232g/km, which equates to tax band L - or £790 in the first year and £445 for each year thereafter. Fuel economy is 28.5mpg, which might not sound great but is significantly better than the previous M5's 19mpg. These figures are largely thanks to the implementation of BMW's Efficient Dynamics, which means you get stop/start and brake energy regeneration. You'll not be able to have an M5 with a manual gearbox, but don't worry because BMW's excellent twin-clutch seven-speed auto ‘box has F1-style paddle shifts. According to the German firm it is just as capable of pootling around town as it is flying along the motorway thanks to ‘Low Speed Assistance', which calms things down for slower-speed driving. The gearbox has three settings to choose from depending on your desired driving style; ‘sporty', ‘relaxed' and ‘efficient'. The chassis promises much thanks to a host of electronic systems that are claimed to boost grip while getting the most amount of power down through the rear wheels and on to the tarmac as is safely possible. As with other ‘M' cars you get the option of ‘Comfort', ‘Sport' or ‘Sport plus' settings. These change the engine, suspension and steering settings depending on what you want from the car. Based on a normal 5-Series, the M5 is distinguishable by its M-Sport body kit, flared wheel arches and extra air-channelling flaps which were apparently the result of many hours of race track development. 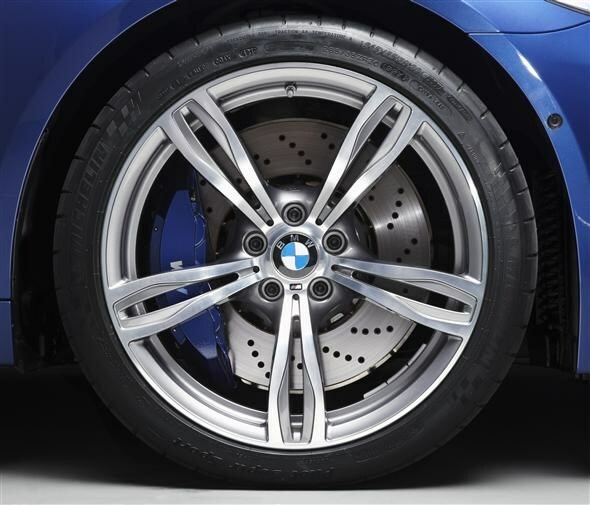 Huge 19-inch alloys hide massive brakes, which are necessary to rein in some of that galactic speed. 20-inch wheels are also available as an option if your tyres aren't expensive enough already. 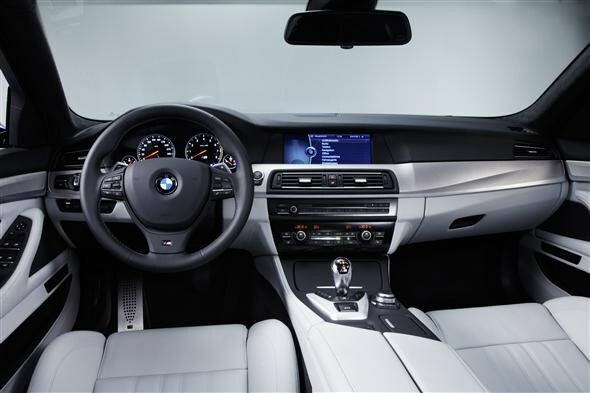 Inside the car you get a smattering of M badges, BMW's iDrive system with a 10.2-inch screen in the dash, special sports seats with leather upholstery and a steering wheel with myriad buttons with which to programme features such as the telephone, radio and cruise control. There's also a pair of ‘M Drive' buttons on the left-hand side of the wheel, which will initiate pre-configured settings for the car depending on the driver's individual preference. Using the iDrive system you can adjust all sorts of aspects of the car's performance. Everything from engine management to how heavy the steering is can be adjusted from the driver's seat. Other standard features on the M5 include sat nav, DAB radio, parking sensors, adaptive headlights, four-zone air con, xenon headlights, heated seats, USB iPod interface, rear-view camera and BMW's ‘Nightvision' system (which does exactly what it says on the tin). iPhone users will be thrilled to hear that they'll be able to display Facebook and Twitter posts on the dash-mounted screen, although we wouldn't recommend updating your status as you hurtle along the A1. 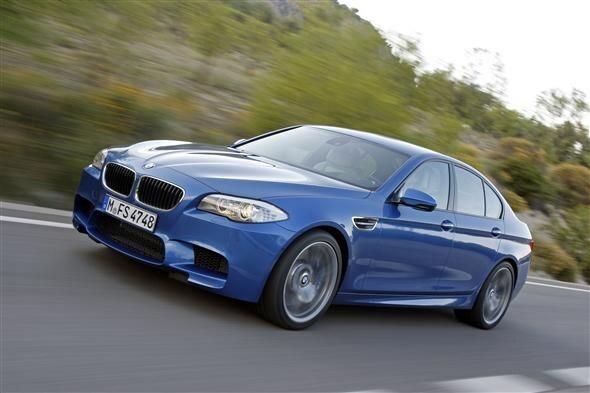 The new M5 will go on sale in November this year at an eye-watering £73,040. 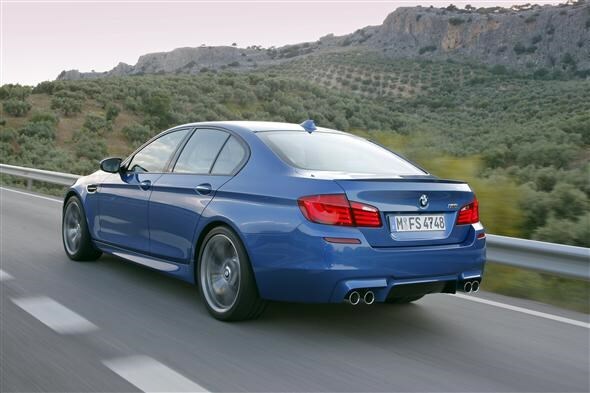 Did you know the most popular review for the 5-Series range is the BMW 5-Series Saloon review.